The title sounds like something that students would drink, but WMS Gaming’s slot is far from frenzied, though it might still pique many a player’s interest. A simple looking slot, it has only three reels with three rows, and has only five paylines. The design is that of an old computer screen with some controls at the bottom. The background is a simple dark navy blue, and the whole process is accompanied by futuristic sounding music. There aren’t actually many symbols in this game, but the ones that present are the standard slot game icons. There are red, purple, yellow and green sevens, and Bars. 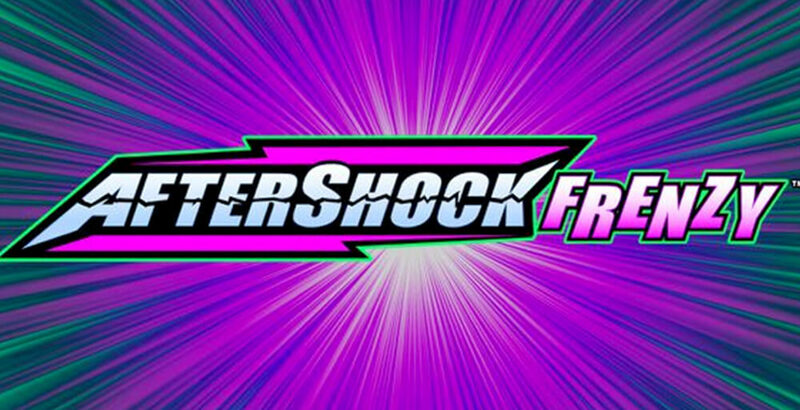 A wild is represented by the word ‘wild’ in purple, white and green, and there are double and triple Aftershock Frenzy icons that activate the bonus features. of 96.10%, allowing players the chance to win frequently and sometimes to win big. There are a number of different bonuses in this game, and these will be outlined here. The first is the Double or Triple Aftershock Frenzy. The double only appears on reels one and three. The triple Aftershock turns up on reel two only. Both symbols will also act as wilds and have different payouts on offer. 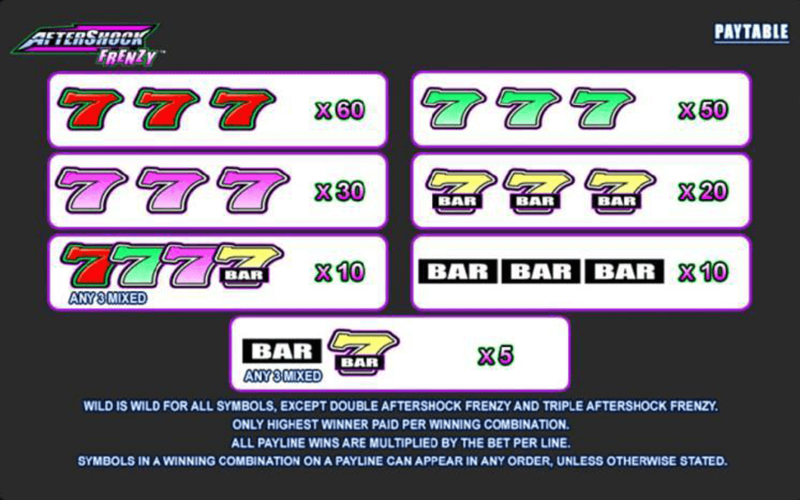 The Double Aftershock on the payline will pay double the win; the Triple pays triple the win. Two doubles pays out four times the win, while both a double and a triple will pay out six times the win. There is also a Big Bet option for players to participate in. 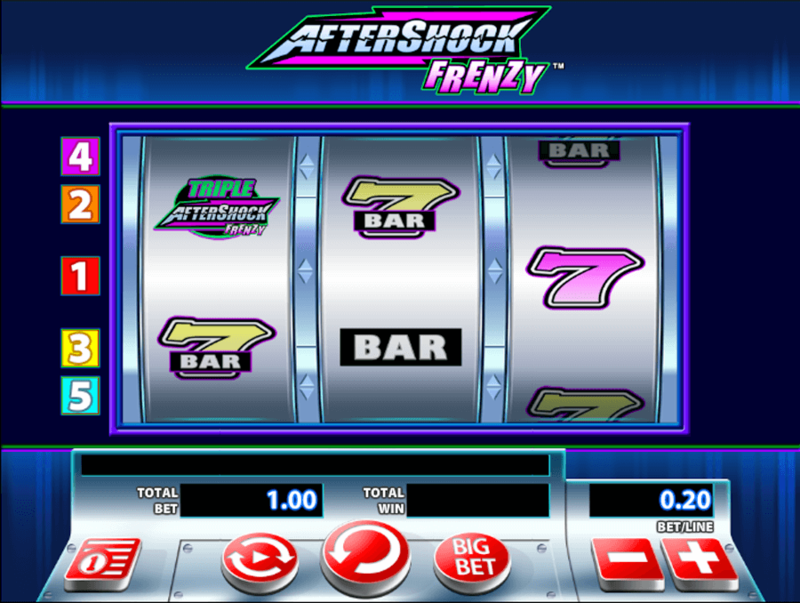 This option does cost extra money but with this extra payout comes five spins, and all of the Aftershock symbols will turn into triples and replace any double that is on the reel. This significantly increases winning potential for the player, so this section of the game can be well worth splashing out on. The second feature is the Aftershock Frenzy. This is activated at random during any spin, and players will win a random number of free spins with a maximum of seven that can be gained. Each of the spins offers a guaranteed win for the player. Any Aftershock icon that lands on the central payline or one position away from it will also trigger shocking wilds. The Aftershock symbol will then stay in the same spot on the reel for the remainder of the spins. also increases to 97% when players utilise the Big Bet feature, making this game an even more lucrative one.